Height30 inches, afila type vine (semi-leafless) determinate. Spacing2 - 3 inches between plants, 18 - 24 inches between rows. Plant 2 to 3 rows close together and plants will intertwine, becoming self-supporting. Fruit5.25 - 6 inch long pods with 6-8 seeds. Seed CountApproximately 225 seeds per packet. 1/2 lb. is approximately 680 seeds, 2lbs. is approximately 2,720 seeds. CommentsDark green, flat, up to 6 inch long pods, resistant to Fusarium wilt race 1, Powdery mildew. 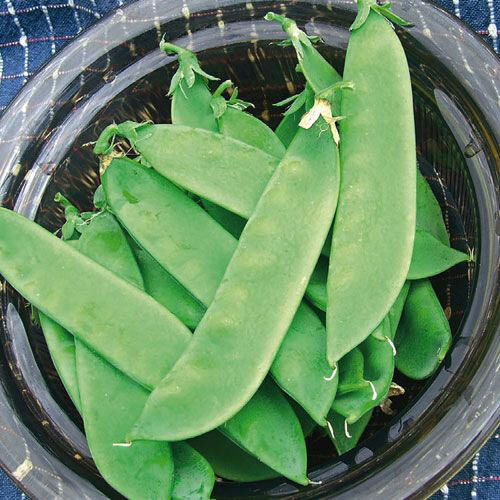 Very high yields of extra large pods, perfect for fresh use as well as processing, good sweet taste, tender texture, performs very well in the garden.